Weekly newspapers are reviewed multiple times per week and read cover to cover, and the ads in newspapers are deemed to be the most truthful compared to other media. "AWNA has provided DDB with outstanding service for 20+ years. Their relationships with the majority of the community newspapers and their “One Order –One Bill” saves the agency hours on each campaign we run. They offer increased value for our clients and we would not consider an Alberta market campaign without them as our partners." "The Department of National Defence was having difficulty recruiting specialised skills through online advertising. In order to broaden our search we turned to community newspaper advertising. The Community Newspaper Associations are organised so you can place ads by region or across the country. Once you determine what you wish to advertise and the area you want to canvass, they do all of the rest. In our case job placements are advertised nationally, with a distribution of more than 600 local papers we were able to reach a much more diverse group of individuals and successfully received applications from all regions. This provided us with a greater selection of qualified people with one simple process. I highly recommend this option to managers who wish to expand their human resource tool kit with minimal effort and high return." THINKING OF SOCIAL MEDIA FOR YOUR MARKETING CAMPAIGN? AWNA ADvisor can assist you in reaching your target audience. 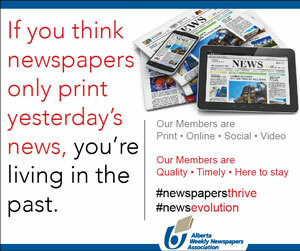 The AWNA is Alberta & NWT's TRUSTED community newspapers association since 1920.